Do you feel annoyed about tying to your desktop but unwilling to miss any important emails, business news or stock market information? Do you feel like the entertainment going with you? Here we introduce a perfect one for you. Powered by Windows Mobile 6.0, this Smartphone provides an office system on the move. In addition, it is optimized for entertainment. There are many interactive and animated games loaded in this Smartphone. Also, it supports multiple video, sound, picture formats so that you can enjoy your favorite movies, songs and photos at any time in any place. Finally,this cell phone’s display is the headset’s design showpiece. The sleek and stylish look is so appealing. You will win envious looks toting this Smartphone. Just enjoy it. 2.8-inch LCD well-rounded FLO touch screen. 2.0 mega pixels camera, built-in Micro spur switch. Windows Mobile 6.0 as the operating system. MS office, Direct –push email, Windows media player, Loaded with all kinds of games, PCC, JAVA, 3D, Simulated games. Support third-party programs to realize numerous practical software applications such as e-map, dictionary. Bluetooth and Active sync Connectivity. 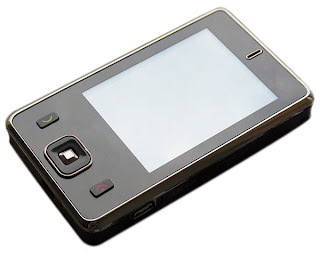 Pocket MSN,Encrypt data on storage card,SMS Remote Control.